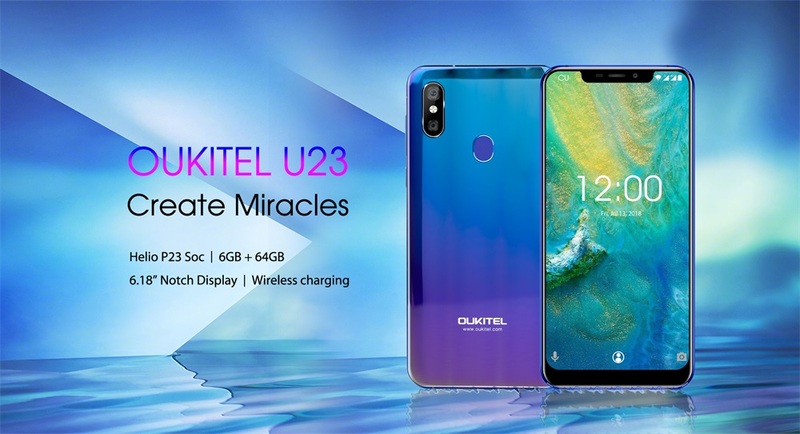 Oukitel U23 smartphone features a 6.18 inch LCD IPS notched display set at a resolution of 1080 × 2246, comprised of 2.5D curved glass. The screen-to-body ratio is enlarged up to 95%, realizing your imagination for full screen. 18:9 aspect ratio matches the super narrow frame, giving you a perfect and wider visual effect. Do you like the fancy of galaxy and rainbow? Oukitel U23 is packed into an aluminum frame in a stunning blue to purple gradient hue that's coated in clear polycarbonate at the back to prevent scratches in the metal. Among same price smartphones, U23 is obviously more powerful in performance. A MediaTek Helio P23 octa-core is clocked with four ARM Cortex-A53 cores clocked at 2.0GHz and four more at 1.5GHz, upgrading 30% handling speed but decrease the battery consumption. Backing that is 6GB of 1600MHz LPDDR4 RAM and 64GB storage, which allowing to be expanded up to 128GB via microSD. The high density 3500mAh large capacity battery supports 10W wireless charging, no clutter cables, no plug in, no plug out, one step to enjoy the cable-free convenience.